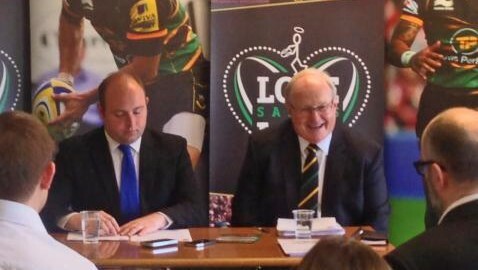 Northampton Waterside Enterprise Zone is to benefit from the Borough Council’s new partnership with rugby club, The Northampton Saints. The Saints teamed up with Northampton Borough Council to promote the town’s culture, leisure and business opportunities, including the Enterprise Zone to their 13,000 fans. With international stars like Tom Wood, George North and Ben Foden the partnership will lay the groundwork for both the Saints as a club and Northampton as a town to capitalise on the long-term legacy that will be brought to rugby union by the return of Rugby World Cup to England in 2015. “A healthy relationship between a sports club and the local council can be very beneficial to all concerned. “This partnership will help not just the club, but our supporters and the town’s businesses as well. Supporters from every club who attend matches at Franklin’s Gardens will be able to enjoy special offers from a range of businesses, who in turn will benefit from increased footfall. “With the Rugby World Cup coming to the East Midlands in 2015, we have to be ready to reap the rewards of the increased profile and attention that the sport will have. This does not only mean having more supporters for the Saints, but also making sure that these gains are felt across Northampton, too. Northampton Borough Council leader David Mackintosh says that this new partnership represented a furthering of the positive relationship that the council and club have developed over the past three years. For more information see: http://northamptonez.co.uk/news/saints-announce-exciting-partnership-northampton-borough-council.